We are right at JBR Beach. Our hostel Dubai Beach Host has full sea view over to Arabian Ocean and Palm Jumeirah Island (the man made island). You can relax on the large sea view terrace and in lounge room with music. We also provide access to Gym, Swimming pool & basket ball court to all the guests.Towels & lockers to put your valuables in it. You can not find a better place to live for holidays. 24 hour manager is available to help & provide information you need. Tram is just 2 minute of walk. We are right on the JBR walk, super market, clubs, restaurants is just down the lift.This is the best location for tourists who want to explore the world famous Dubai city. We provide comfortable dormitories - mixed and female available. Facilities: shared bathroom, A/C, free linen, towels and WiFi access. REFUNDABLE SECURITY DEPOSIT OF 100 AED/ PERSON IS REQUIRED DURING ACCOMMODATION HANDOVER. Excellent hostel,beautiful view,and the manager Lala very friendly and very understandable , for sure coming back again. This is a great place for travellers or people who want to experience along place at a fraction of cost Location and view is breath taking , had been here last year as well , they had improved a lot now Artist Paintworkson terrace area , cleanliness is just wow Some is there to check washroom every 10 mins Changed the beds or mattress now(something looks changed ) , very cosy Staff is always there to help us in anyways possible Also had a experience to view fireworks from the rooftop. Location is just Perfect m It was very difficult to find any issues here , so i can only give 10 / 10 as review , The host is Super amazing , so friendly and helpful , had a experience to view Fireworks of Dubai , 3 boats in the sea , and the best place to view the fireworks is This Roof Top as terrace. 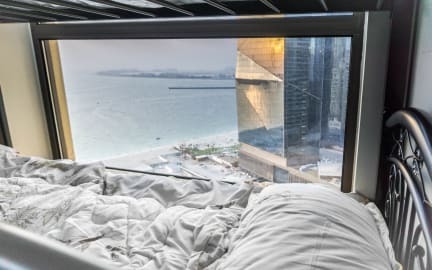 This hostel is the best in Dubai with a world-class view of the marina beach and the Dubai eye.. it is clean and offers luxurious facilities that includes everything one needs for a wonderful stay... Lalla and Vikram are there for you even at the wee hours on the day and are extremely caring ! All in all a very comfortable value for money stay! Everything is perfect! Except two English men they were fighting all the time in the bedroom not respecting anyone, one of them was snoring the other one is watching movies in his computer without using headset, making so much noise!